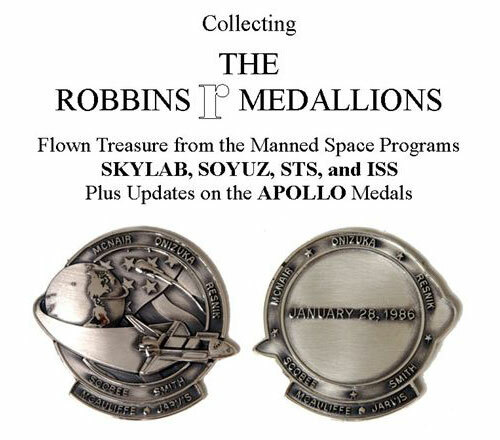 Author Topic: "Collecting the Robbins Medallions"
Written as a continuation and compliment to his first book on the subject (The Robbins Medallions, Flown Treasure from the Apollo Space Program), Howard C. Weinberger's Collecting the Robbins Medallions provides images of all medallions issued after Apollo, including Skylab, ASTP, STS, ISS and "a finding of Long-Duration Space Flight medals", as well as population data, how many were flown, crew members and mission dates. Weinberger writes, "most importantly, I have endeavored to get NGC, the third party numismatic grading and authentication service, to begin encapsulating the medals. I have a chapter on this alone. I believe this will address the restriking issue head-on, as well as a few other [concerns]." 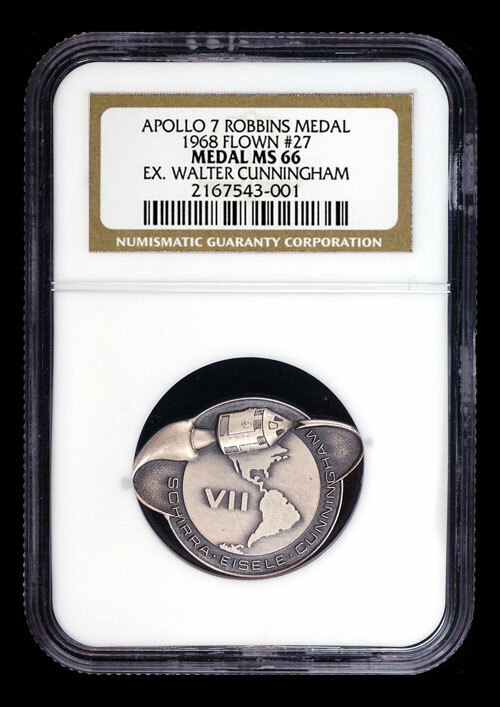 Collecting also provides an update section for the Apollo medals, and additional anecdotes and history that was not included in the first book, including how Weinberger came to understand the history of the Robbins. Other topics include: Care and Display, Valuation Qualifiers, Investor Recommended Medals, Disposition of the Dies, The Robbins Medal process, and more. Thank you for the "head's up." I enjoy the first edit, and look forward to Mr. Weinberger's second edition. The grading concept sound intriguing. I am a Robbins collector and was hoping something could be clarified based on what's above. Was getting NGC involved in the Robbins hobby designed to grade the actual condition of the medallions, or distinguish the restrikes from the originals? The ability of NGC to track the population status of individual medals required that a grade be assigned. It was strictly a logistics issue. I do not believe, at this point, that space collectors really care much about a grade. I know I don't. However, I believe collectors do care about condition. Scratched, dented, improperly cleaned, or otherwise unsightly medals do exist. There are many aspects to the benefits of NGC authentication which I attempt to touch on in better detail in the book. Restriking is one of them. Provenance, authentication, storage and display are others. Once collectors see the medals in NGC holders I think they will agree that they look great. Display has always been an issue for me. The NGC holders bring uniformity to the medals. All the holders are the same size, you can view both obverse and reverse, identification, including serial number and provenance also appear. Not everyone spends the time to become an expert. If there are ever questions about authenticity, restrikes, etc., I believe that many who may have become interested will be scared away. At the very core, NGC authentication eliminates that concern and, I believe, will bring in many collectors because of this new comfort now available. Mr. Weinberger, do you address 'Fliteline' medallions in your book? These were flown medallions from the pre-Apollo era. It seems that these medallions are much rarer to find and authenticate. What do you think? Might it be possible to see an image of a medallion which has been mounted in one of the holders? Do you address 'Fliteline' Medallions in your book? These were flown medallions from the pre-apollo era. I do not cover the Fliteline medallions in the book. I have never been able to document anything about them except that they exist. They are not serial numbered and there is no way to know which were flown or how many exist. Many of the purported flown ones are questionable to me because certification usually comes from someone other than the astronaut. Undoubtedly, some were flown, but I am just not comfortable with them. I do not mean to be unduly hard on them and understand their place. They are just not of interest to me personally. The beauty of the Robbins Medals, besides the step-up in quality, is the fact that we know how many were made, they are serial numbered, and information exists to confirm which were flown and which were not. Based on your reply and the photo above, do you have any concerns that the encapsulation of the medallions forever "separates" the medal from its original snap case? I have paid slightly more for two of my Robbins because they came in pristine numbered cases as per the tips in your first text. Based on your reply and the photo above, do you have any concerns that the encapsulation of the medallions forever "seperates" the medal from its original snap case? Jay - I discuss this in detail in the book. After much discussion and thought, I believe that the original boxes really add NO value to a medal. That said, I would not throw them away, but I don't see paying any premium for them. Does anyone know if these books have began shipping yet? Books are scheduled to ship between Thursday June 15 and Monday June 19. Howard's book arrived today. Very nice and informative. If you collect Robbins medallions, it's a must have. Congratulations Howard. Great Book Howard! Very informative. Very good stuff inside from just flipping through it so far and look forward to reading it cover to cover very soon. I was just wondering if anyone has had their medallions (flown or unflown) encapsulated? If so, can you comment on the quality, service, cost, and outcome? I have had the first nine Robbins Medals sent into NGC and encapsulated. The quality is top notch. If at anytime you decide that you do not want a medal encapsulated, it can be removed from the holder. However, while it is encapsulated, it is tamper proof. I charge $75 per medal plus the return postage fee for USPS Registered and Insured mail if you want me to handle all details with the submission. The fee includes all the paperwork filing, attribution, submission to NGC and encapsulation. You are required to send the medals to me with copies of any provenance letters via USPS Registered and Insured mail. The process will take approximately 30 days from the time I receive the medals. You can see an example of my Apollo 7 medal in the NGC ad in the new book, or also on this message a few entries back. This is how your medals will look. Since the release of the second book, a few discrepancies have emerged about the total population numbers for the unflown silver Robbins Medals from Skylab III, Skylab IV and STS 30. It is my intention to keep the collecting community aware of new and relevant information as it is discovered. The data for the Robbins Medals population numbers and which were flown for the Skylab and ASTP missions was obtained from a Robbins Company memo from George Ryan, the liaison between Robbins and the Astronaut Flight Office. The memo stated there were 300 silver medals struck for Skylab II, 159 for Skylab III and 190 for Skylab IV, and 283 from ASTP. Since the publication of the second book, I have come across information that confirms the existence of Skylab III medals #201 and #290. And just recently, I have been made aware of the existence of Skylab IV medals also numbered above the 190 reported. I have discussed the matter with Chris Sweet, my contact from the Robbins Company. We have looked for anything that may have been overlooked and no further evidence is available, and the people involved who may have been able to shed better light are no longer living. The best we can determine at this time is that the total population numbers for Skylab III and Skylab IV were incorrectly reported in Mr. Ryan's memo. We speculate that the true populations of silver medals for these two missions would likely equal the same 300 medals that were struck for Skylab II. In another letter from 1993 to the wife of an astronaut from the Astronaut Flight Office, the number of flown Robbins Medals advised is the same number as the original George Ryan memo from years earlier. This letter provides comfort that the number of flown medals is still accurate, which I consider the most important data. There are two corrections regarding the medals for STS 30. The first is an honest typo regarding the unflown silver medals. The book reports that there were 65 unflown silver medals numbered 49-113. The correct number should have read 68 unflown silver medals numbered 49-116. After the book was published, it was discovered that medals numbered 140 and 141 existed. This once again prompted a lengthy discussion and comparison of notes with Chris Sweet. What was noticed this time, upon close inspection of the notes from that particular mission, was a footnote with the number 62 circled. This type of footnote did not appear on any other mission notes so it was originally ignored. Chris explained that it was a notation of an add-on order of unflown medals done at a later time. If we add the 62 medals from the new order to the 116 confirmed, the total is now 178 total silver medals, which would allow for the existence of the medals numbered 140 and 141. Howard- I think it's wonderful that you're continuing to keep our collecting community up to date on the latest learnings in the Robbins Medallions' space. You've really opened our eyes to this exciting part of space history. Thanks for the continued updates! I fully agree with Albrecht. Without Howard's pioneering work we would still be in the dark ages about Robbins Medallions.